T-R PHOTO BY STEPHEN KOENIGSFELD • Tylyn Eicher tees off from Hole 2 on Monday during the girls’ Class 3A first round regional at Lincoln Valley Golf Course in State Center. 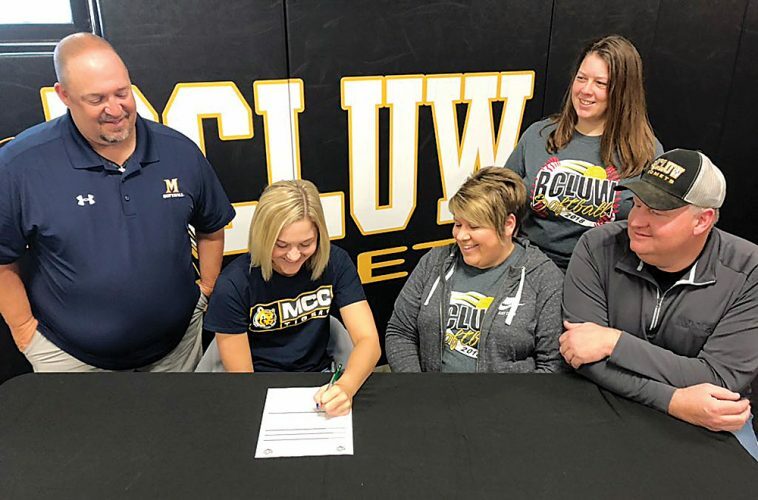 Eicher led the East Marshall girls with a 99, and helped them to a third-place finish, but the Mustangs did not qualify for the regional finals. 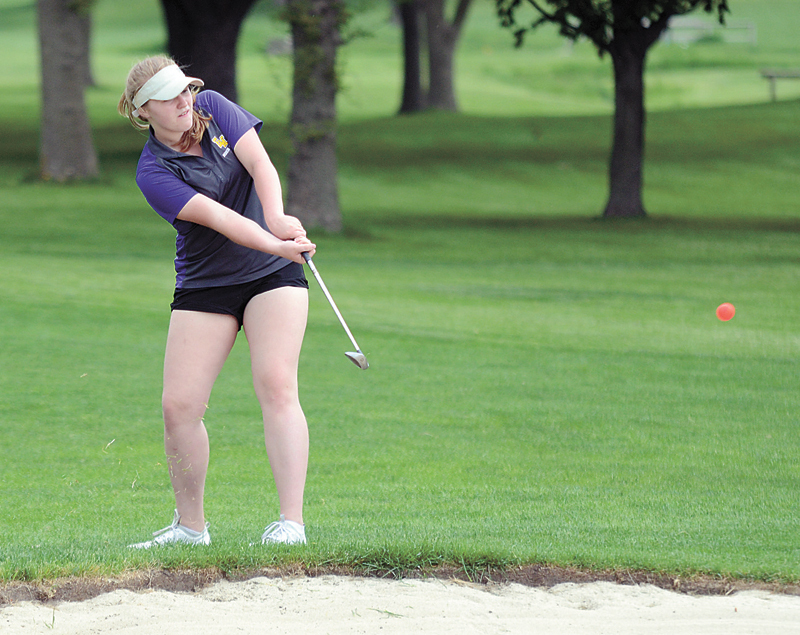 STATE CENTER — As the scorekeepers tallied up the incoming cards, there just appeared to be too many big numbers on those of East and West Marshall golfers Monday at Lincoln Valley Golf Course. As the team totals got higher and higher, and by the time the last nine holes were counted, the Mustangs’ and Trojans’ fates were sealed. East Marshall posted a 434 team score for third place and West Marshall was just behind with a fourth-place 438, and both schools failed to advance to Monday’s final round of regional qualifying golf. East Marshall’s Tylyn Eicher led all area golfers with a 99, shooting 51 on her front nine and coming back with a 48 on her back. East Marshall head coach Denny Allen said chipping and putting is where the Mustangs found their big numbers, but coming out third in a regional of eight teams was alright by Allen. T-R PHOTO BY STEPHEN KOENIGSFELD • Brooke Snider putts on the ninth hole Monday during the girls’ Class 3A first round regional meet at Lincoln Valley Golf Course near State Center. Snider led West Marshall with 108, but the Trojans failed to advance to the next round of postseason play. Kuemper Catholic and PCM were the two teams moving on to Monday’s final regional round at the 5 by 80 Golf & Country Club in Menlo. The Knights shot a regional-winning 373 and PCM was in with a 395. PCM’s Bre Maher was the tournament champion with a medalist score of 84. Both Kuemper Catholic and PCM had the five low scores, filling up the individual qualifier spots as well. Eicher wasn’t too far off with her 99, as Katie Schweers (KC) shot a 95 for the fifth and final qualifying spot. The Mustangs’ No. 1 Bobbi Amendt had what Allen said were some “hiccup holes” that led to her 117. She ended up scoring because of a disqualification of Tiffany Thompson. The senior signed an incorrect scorecard, negating her 110 score. It wasn’t low enough to send the Mustangs to state over PCM, but did sting a bit as her score would’ve counted. Amanda Paxton came in with a 104 for East Marshall and Jazzy Leavy posted 114 to be the third scorer for the Mustangs. West Marshall had similar woes, finding too many big numbers to overcome, leading to a fourth-place eliminating round of 438 on Monday. The Trojans were led by Brooke Snider who shot 108 (53-55) and Karissa Blocker’s 109 (57-52). West Marshall head coach Kim Tarbell said the chipping and putting were also where the Trojans lost ground on their competition. Senior Rosie Dawley scored third for West Marshall, shooting a 110 and Whitney Edler posted a 112 to be the fourth and final scorer for the Trojans. Tarbell said she’s got high hopes for her team next year. Another year of experience and another offseason of work could pay dividends for a team that returns five of its six varsity golfers, with three of them being freshmen. Tarbell said Edler’s 111 was one of her best scores of the year. 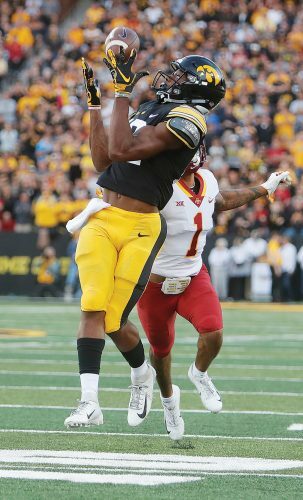 She’ll be one of the three returning freshmen next year. The BCLUW girls’ golf team will be advancing to the final round of their 2A region, as they were second place Monday at the Woodward Golf and Country Club, posting a team score of 401. The South Hamilton girls edged out the Comets by a stroke, scoring 400 to win the regional in Woodward. Mackenzie Trinkle shot the low area score with a 96, placing third individually. Lauren Anderson and Katie Garber each posted 101 and Bailey Ashton shot a 103 to round out scoring for the Comets. BCLUW will play in Winterset on Monday at the Winterset Country Club, teeing off at 9 a.m. The Grundy Center girls also advanced as a team, placing second with a 415 in Nashua on Monday. Reagan Derrick had the low score of 99 to place fourth Monday, helping lead the Spartans back to the regional final at Rice Lake Golf Course in Lake Mills. Abby Hockemeyer shot a 103, Sarah Hockemeyer shot 106 and Frannie Brown posted 107 for the Spartans’ top four scorers. Four area individuals will be advancing on their own to Monday’s regional final meet. AGWSR was fourth at their regional first round meet in Britt, scoring 424 as a team. Mandy Willems and Molly Abkes both shot 98s and tied for fifth, sending them both on to the next round of qualifying. 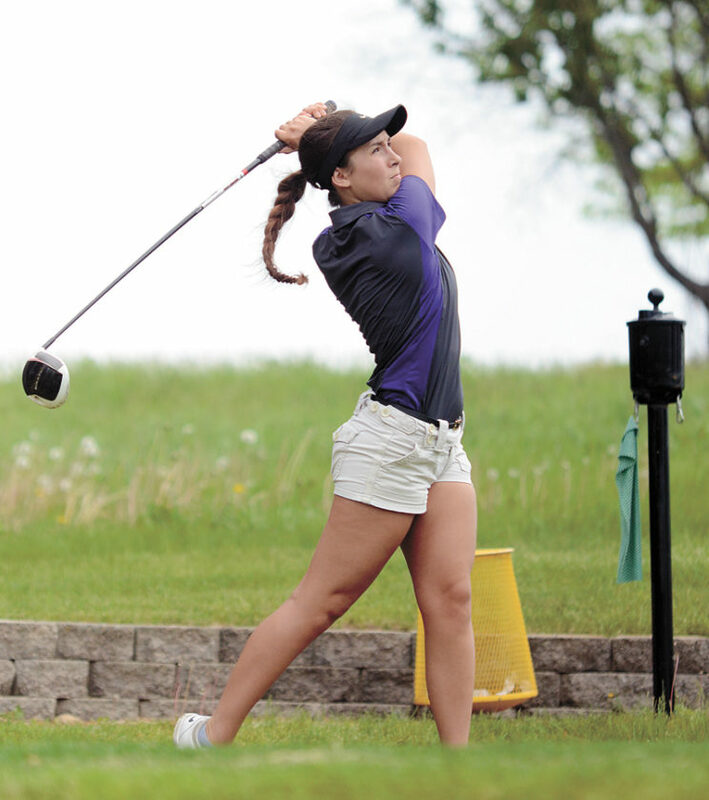 The two AGWSR golfers will play at Spring Valley Golf Course in Livermore on Monday, vying for a shot at the state tournament. North Tama will also be sending two individual golfers to the regional final round. Claire Schafer was the individual medalist with a 92, and Olivia Schrier was runner-up with a 96 to advance individually at the Region 4A in Tripoli. The two Redhawks will play Monday at Little Bear Recreation Club in Wyoming, teeing off at 9 a.m.
PHOTO PROVIDED BY MIKE RUEFER • Marshalltown’s Darrel DeFrance, right, added a 14th Deery Brothers Summer Series trophy to his collection by winning the Sunday night main event at Quad City Speedway.